The Downtown Emergency Service Center (DESC) was founded in 1979 to provide emergency shelter and survival services for people living in a state of chronic homelessness and who, due to their severe and persistent mental illnesses and substance use disorders, were not being served by existing missions of that day. Today, DESC is a recognized national leader in implementing innovative, cost-effective strategies that end homelessness. The Estelle opens on February 27th, providing 91 apartments of supportive housing. DESC breaks ground on a new supportive housing building at N 96th Street. DESC announces plans for another supportive housing building at 1911 22nd Avenue. The fourth Housing First Partners’ Conference is held in Denver. DESC’s Navigation Center opens with 75 beds for people living in unsanctioned outdoor encampments. Robust 24/7 services help them leave homelessness. DESC’s Connections program was open in partnership with the City of Seattle from 2006 to 2017. During that time it served thousands of people by connecting them with case management, employment and hygiene services. The HOME project took place from 2015 through 2017. During that time, a multi-disciplinary team of providers worked to secure housing for people who are chronically homeless high-utilizers of the shelter systems and also live with a substance use disorder. With an original goal of finding housing for 135 adults, the program succeeded in finding homes for 194 people! DESC breaks ground on The Estelle, a permanent supportive housing building in Rainier Valley to end homelessness for 91 more people. The third Housing First Partners’ Conference is held in Los Angeles. Queen Anne shelter opens, providing shelter for 100 men to respond to the growing homelessness crisis in the community. 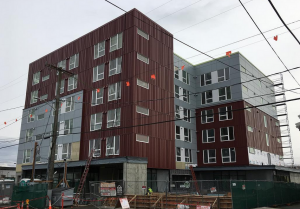 DESC’s Interbay Place opens, providing 97 units of affordable housing with supportive services for homeless people living with serious mental/addictive illnesses or other disabling conditions. Keys to Home program starts. January 1, 2014 marks 12,460 consecutive days that DESC’s Main Shelter has been open. MIST (Multidisciplinary Intensive Support and Treatment) completes a three year SAMHSA funded project to engage and house chronically homeless people with substance use disorders and severe mental illness. DESC launches the HOME program (Housing Opportunities and Meaningful Engagement) in October 2014 through a three-year grant award from SAMHSA. The purpose and goal of this program are to engage, stably house and make needed services and treatment available to chronically homeless individuals identified as Long Term Shelter Stayers (LTSS) in Seattle and King County. The second Housing First Partners’ Conference is held in Chicago. Aurora House opens in early 2013 providing 87 units of supportive housing for homeless adults living with serious mental/addictive illnesses or other disabling conditions. DESC launches our Crisis Solutions Center (CSC). Cottage Grove Commons, a 66-unit supportive housing building, opens in the North Delridge neighborhood in West Seattle. DESC receives the Nonprofit Sector National Achievement Award from the National Alliance to End Homelessness for its ongoing efforts to end homelessness among those whose struggle with homelessness is compounded with mental illness and substance use disorders. DESC and NYC’s Pathways to Housing present the first ever national Housing First Partners’ Conference in New Orleans, LA on March 21-23, 2012. The conference is attended by over 650 service providers, federal, state, and local government officials, researchers, advocates, trainers, peers, and thought leaders engaged in ending homelessness through Housing First. DESC’s Multidisciplinary Intensive Support and Treatment (MIST) is funded by a federal grant from the Substance Abuse and Mental Health Services Administration (SAMHSA) for a period of three years beginning October 1, 2011. The goal is to access sustainable permanent housing, recovery supports, and mainstream funding sources for chronically homeless individuals who have the highest crisis system usage and/or the highest scores from DESC’s Vulnerability Assessment Tool. DESC opens Canaday House, an 83-unit supportive housing building named in memory of former DESC volunteer and advocate, Nick Canaday. Twenty-five units are designated for disabled veterans. Rainier House opens, providing an additional 50 supportive apartments in the Columbia City neighborhood. DESC and Harborview Medical Center launch a federally-funded pilot project to provide integrated primary and behavioral health care services to people who are homeless. An innovative employment program is established to match DESC clients with local employers. DESC’s thrift store serves as a valuable training tool to enhance clients’ basic job skills and prepare them for retail employment. DESC launches PACT, an intense, multidisciplinary program for people with serious mental illness, who have lived in psychiatric hospitals for long periods. Named for a former DESC employee, Evans House opens to provide supportive housing for 75 adults. DESC launches The Connections program, establishing a center where non-disabled clients can access showers, computers, job-counseling, and other services to help them find employment, housing, and independence. After two years of controversy and lawsuits surrounding the project, 1811 Eastlake opens, providing 75 units for chronically homeless people with severe alcohol problems who, previously, were the community’s high utilizers of public services. In 2009, The Journal of the American Medical Association publishes a study revealing that 1811 Eastlake saved taxpayers $4 million dollars in its first year of operations. A $27 million renovation of the Morrison Hotel begins, resulting in a state-of-the-art shelter and day center, centralized administrative offices, and five floors of supportive housing. The Morrison Hotel becomes DESC’s largest housing project, marking the turning point at which DESC houses more people than shelters them. DESC extend its prioritization of vulnerability to daytime services, and implements an evaluation tool to objectively measure a client’s vulnerability based on his/her health, disability, and level of functioning. DESC’s Kerner-Scott House Women’s Shelter Opens, providing 25 beds for Seattle’s most vulnerable homeless women. DESC launches a Client Housing And Service Entry and Reporting System (CHASERS), its internally developed electronic database that enhances the agency’s emphasis on highly integrated services and housing. The system is later adopted by other human services agencies. DESC becomes a licensed chemical-dependency provider, allowing both emergency shelter and housing clients with co-occuring mental health and substance use disorders to receive critical services. DESC begins the Crisis Respite Program (CRP). Working in partnership with Harborview Medical Center and others, CRP provides shelter and case management for people living with mental illness emerging from a recent hospitalization. DESC opens the Lyon Building in partnership with AIDS Housing of Washington (now Building Changes). The 64-unit facility is DESC’s first Harm Reduction Housing model. DESC introduces to the region the concept known today as Housing First by opening Kerner-Scott House, which uses housing as a way to engage people into services. Its 40 apartments are designed to provide stability for adults experiencing homeless with no previous connection to services. DESC establishes SAGE, a program delivering Medicaid-funded outpatient mental health treatment to clients. This marks DESC’s entry into the mainstream mental health service community. DESC develops a scattered site housing program, to assist homeless clients enrolled in DESC’s SAGE program in renting affordable apartments while receiving ongoing care. The Union Hotel opens, DESC’s first supportive housing program featuring 24/7 onsite clinical and support staff for 52 previously homeless residents. As demand continues to grow, the lottery method is replaced with a system to prioritize overnight beds for those individuals most vulnerable on the streets – those living with disabilities, women, and elderly men. Due to ever-increasing demand, DESC’s shelter expands operations to 24 hours daily and opens an overflow winter shelter that accommodates an additional 50 clients. DESC becomes the first agency to partner with Common Meals (now Farestart) to serve weekend meals to its shelter clients. DESC begins coordinating downtown street outreach with DAETN (Downtown Access, Engagement & Transition Network) to establish first contact with Seattle’s most vulnerable homeless adults. This eventually leads to DESC being selected for the Federal Demonstration program, ACCESS, and the current HOST program. As one of only a dozen sites selected nationwide by the Robert Woods Johnson Foundation, DESC partners with the newly-created Health Care For the Homeless to further integrate chemical dependency, mental health, and nursing care into its shelter services. DESC clients and staff arrive en masse at Seattle’s Public Safety Building to publicly protest the lack of shelter beds. The act results in new community shelters, including the first severe weather overflow shelter opened by the City and King County. DESC is featured in the nationally broadcasted PBS documentary, Shelter, produced by Seattle station KCTS. With long lines at the shelter resulting in people being turned away, DESC develops a lottery system to replace the first-come, first-served method. With increased demand for services, DESC extends its hours. The shelter is now open from noon to 7 a.m.
DESC is granted a license by the state to deliver mental health care, the first step in the development of a full continuum of care for clients. On November 19, DESC opens its doors as an overnight emergency shelter in the ballroom of Pioneer Square’s Morrison Hotel. From 7 p.m. to 7 a.m., a staff of 14 welcomes nearly 200 homeless adults through its doors on a first-come, first-served system. DESC begins as a partnership between the City of Seattle, the Greater Seattle Council of Churches, and WAMI (Washington Advocates for the Mentally Ill) to address the shortage of services in the community.